posted: December 05, 2017 by: Ponderosa Vet Hospital Tags: "Clinic Specials" "News"
Enjoy those Christmas kisses! 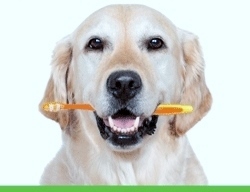 Give the gift of fresh breath and a clean, healthy mouth for your dog or kitty. Schedule a dental cleaning in December and receive $40 off plus a dental treat bag.